It's Monday, it's the first of the month so that must mean it's time for another round of empties. I haven't appeared to have used to many items this month and now I'm embarking on a spending ban of sorts (more sensible spending than ban shall we say!) so trying to use what I have in my stash rather than adding more items that I don't need nor have the time to use! Enough rambling, on with the empties. First up is Molton Brown's Warming Eucalyptus and Ginger Salt Scrub. I absolutely love the smell of this scrub and have the matching shower gel which is a winter favourite when I'm suffering from a cold and was actually dug out of the cupboards last week when I had a bit of sniffle. This is a definite repurchase although likely later in the year read for the cold season - and of course I'm desperate to try the Soap & Glory Breakfast Scrub receiving rave reviews from bloggers everywhere. L'Occitane Almond Shower Oil is my desert island essential. This is the one product that I have repeatedly used and repurchased time and time again. Again I love the smell which lingers long after your bath or shower but more importantly how fabulously it leaves your legs when shaving. Having pre-beauty blogging times I was very lax with body lotions so this shower oil helped put some moisture back into my legs. The only negative with this product is that it's not ideal for the Summer months when tanning so I'm currently embracing new shower gels and body lotions to compensate. Kiehl's Ultra Facial Toner was a bit of a miss with me. I was given this as a freebie when buying my Kiehls skincare haul (see post here) a few months ago and glad I never added the full size to my purchases. I literally have nothing to say about this product as there was nothing significant to mention. I didn't enjoy using, my skin didn't acknowledge I had used and I could easily have been putting water on my face! 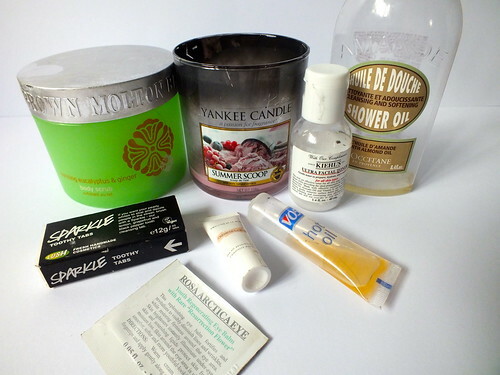 When I received VO5 Hot Oil* treatments in the post I was instantly transported back to being a teenager. I remember back in my younger days when I wanted to feel grown up, popping the oil in a mug of hot water before treating myself to a treatment - so glam! I'm actually typing this post with my hair wrapped up in a towel following a second hot oil treatment as they're just the Sunday night boost I need. Unfortunately I cannot give a full review on the Rosa Arctica Youth Regenerating Eye Balm from Kiehls as there wasn't enough to use long enough but as a cream on the eye area it felt pleasant and no complaints. 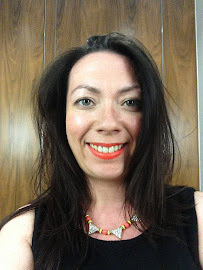 You can see a full review on LUSH Sparkle Toothy Tabs here but I'm a fan but think I'll be reserving for travel only. The next item was a BIG disappointment. Chatting with a fellow blogger I saw that Yankee Candle had brought some new scents out for Summer so I immediately purchased Yankee Candle Summer Scoop and Fireside Treats. Sadly I found that both were lacking in scent. I do love Yankee Candles but find they're hit and miss whether the smell is strong and in the case of these two - nothing! I thought it may have been me but mum commented that she couldn't really smell anything either. Currently I'm burning another newbie, Movie Night and my living room is filled with the smell of popcorn! The Creme De La Mer Oil Absorbing Lotion was another sample that I was impressed to be handed on one of my far to frequent trips to House of Fraser. Again I don't feel there was enough product to give a full review but I did find this quite a watery lotion that didn't feel particularly luxurious bearing in mind the price point. I'm not surprised they're having to charge so much for their products as on another trip a few days later they were once again handing out samples! I was a good daughter on the second occasion and handed over to my mum to use. So there you have it, some thumbs up and thumbs down on the empties for June. As always let me know if you've any thoughts on any of the products I've discussed and if you have an empties post this month share your link. So many empties! I really want o try that shower oil! Everyone raves about it.